Yes. 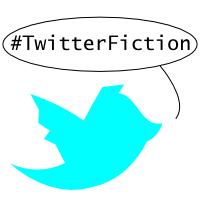 I am going to write #TwitterFiction. I decided to jump into this venture because of what I see on Twitter. I see established authors writing about the writing process. (Thanks @Kelsye, @thecreativepenn, and @KevHeritage.) I read tweets from experts on cover design and social media and other parts of the publishing process. (Thanks @JFbookman and @roncallari.) And I read stuff from folks who are trying to establish their author platforms and maximize their social media exposure. They all seem to be doing the same things. With varying degrees of success. What these folks seem to be doing is pointing Twitterers to themselves and to other authors, who are trying to do what they are doing. This is great from a networking perspective. After all, you want to be around people you want to be like. Even digitally. However, there comes a time when you need to come down from the mountaintop. You need to meet the people who you were sent to. You need to talk to the readers. So that is why I am going to write some #TwitterFiction. My plan is simple. I am going to spend a little time each day writing a short story. Or a long story. It all depends on what my characters decide to do. And if I get stuck, I might even ask readers to help me out. All I am going to do is grab a prop, a line, and a character and go. Just like when I wrote a bunch of scripts as an exercise with one of my writing friends (thanks @kphotomedia). So instead of spending lots of time fixing up my book covers or pointing to my writing (MediocreMan.com), I am going to write serial fiction in addition to my other myriad projects. I may never be as good as Sir Arthur Conan Doyle, Charles Dickens, or Louis L’Amour (who all wrote serially). But they never had to write just 140 characters (minus the hashtag) at a time. This project will certainly different. Just like me.